PPM are pleased to announce the that another European Airbus site has chosen Sentinel 3. Airbus Defence and Spaceheadquarters in Ottobrunn, near Munich. have chosen to integrate the Sentinel 3 RF over fibre system to their data acquisition platform. Airbus are a partner in the Eurofighter Typhoon consortium which also includes BAe Systems and Leonardo. Other activities at the site include development and manufacture of Arian 5 rocket engines and production of solar panels for satellites. NASA’s James Webb Space Telescope was built in the Ottobrunn site which also houses some of Airbus’ support functions such as Airbus cyber security, information management and finance. Saving time and improving accuracy. Sentinel 3 is the worlds most advanced RF over fibre system for EMC testing. The system was designed for rapid and flexible deployment, from remote transmitters through to the controller and receiver chassis. 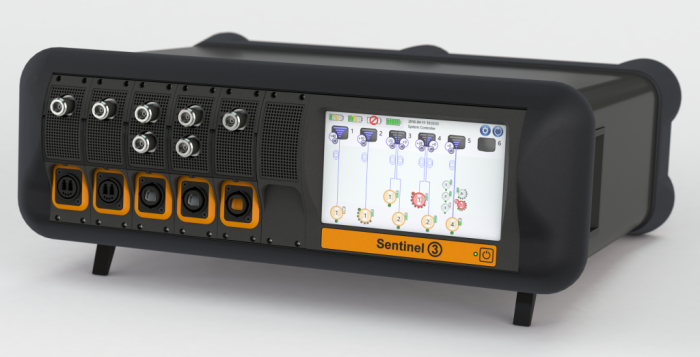 Upgrading to a Sentinel 3 system is anticipated to save a significant amount of setup time. Furthermore, features such as automatic thermal temperature compensation and 0.25dB accuracy specification are designed to improve measurement results. The Sentinel 3 system has been very well received by companies involved in the Eurofighter programme,” says Dr Martin Ryan – managing director of PPM. 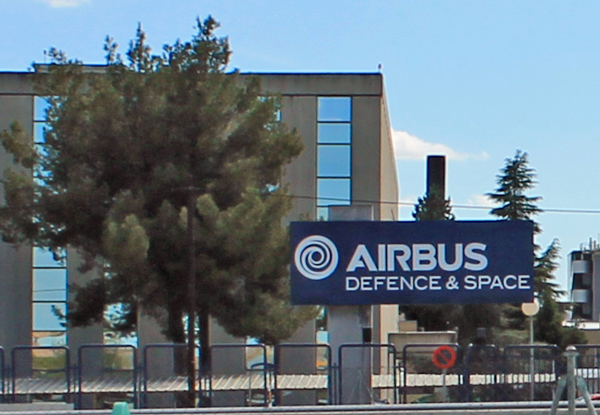 “We are very pleased to be supporting with another Airbus site with Sentinel 3. As always, our software team are ready to help with integration of Sentinel 3 into an existing data acquisition platform which typically might include current probes, E-field probes and RF amplifiers. 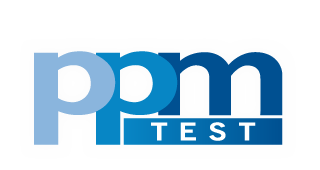 PPM Test is a division of pulse power and measurement Ltd. which has been manufacturing RF over fibre systems since 1995. PPM have supplied RF over fibre to some of the world’s largest manufacturers of aircraft, military and civilian vehicles. The company develops and manufactures in Swindon, UK. Measure the coupling of EM energy (transfer function) into the interior of the aircraft over the total frequency band of all the environments by illuminating the aircraft with low level swept continuous wave (CW) radiated fields. These measurements are normally made in “free field” conditions. Where the transfer function is in terms of the external field to the internally induced cable bundle currents it is known as the Low Level Swept Current (LLSC) test (Figure 1) and when it is in terms of the external field to the internally induced fields it is known as the Low Level Swept Field (LLSF) test (Figure 2). Use suitable signal processing algorithms and compute from the coupling measurements the currents (100 MHz) at the equipment’s location, that would be induced by the HIRF environments on the wiring systems. Directly inject the predicted threat currents on the wiring systems, or at higher frequencies (>400MHz), irradiate the equipment and its wiring being assessed with predicted threat fields. Appropriate modulation is applied to simulate emitter parameters. This testing can be applied at system rig level (alternatively termed the systems integration facility), providing the rig is an accurate representation of the aircraft system. Cable bundle currents can be measured using small ferrite current transformers or probes. 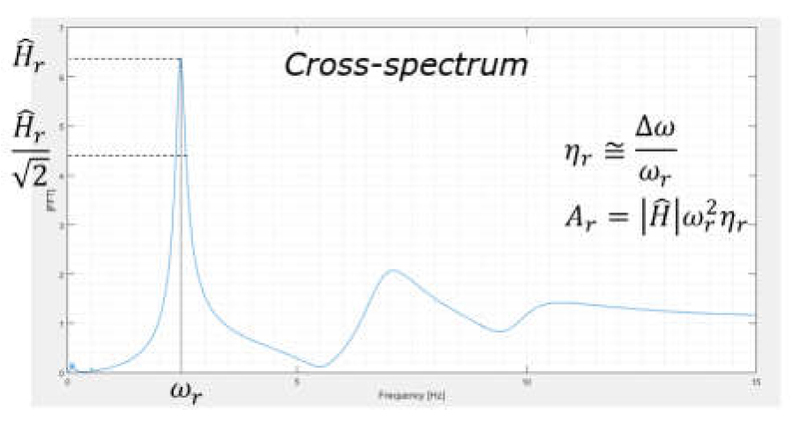 The internal fields can be measured using small broadband antennas, such as the “Top Hat” biconical 1- 18 GHz receive antenna shown in Figure 2. Signals from the current probes/antennas are coupled back to the remote instrumentation using analogue FOLs to as high a frequency as possible. Multi-channel FOLs, such as the PPM Sentinel 3 cover frequencies up to 3GHz. Above this frequency, cables are used with great care to ensure they don’t compromise the integrity of the airframe shielding being assessed. Future fibre optic technology will likely permit reliable FOLs to be developed to cover the full low level swept coupling range of 10kHz to 18GHz. This would dramatically improve the measurement dynamic range as such high frequency FOLs would remove the cable losses which become large above 1GHz due to the cable lengths involved. As an example, even low-loss microwave signal cables have loss figures of typically 1 dB/metre at 18GHz. As part of an aircraft’s certification for flight, aircraft must demonstrate safe operation within a range of environmental conditions. This includes Electromagnetic Environmental Effects (E3) which, for civil aircraft, include High Intensity Radiated Fields (HIRF) and Lightning. Both HIRF and lightning testing involves either (i) high level whole aircraft testing or (ii) a hybrid test method of low level aircraft testing with high level equipment testing. For either test method, fibre optic links (FOLs) are essential to prevent compromising the measurements. For example, during low level swept current and field measurements, FOLs are employed to provide signal gain and isolation from the generated EM environment, typically from 10kHz to 1GHz. Instrumentation should not influence the aircraft’s transfer impedance whilst it is exposed to RF fields or simulated lightning – for example, currents that degrade the airframe shielding. 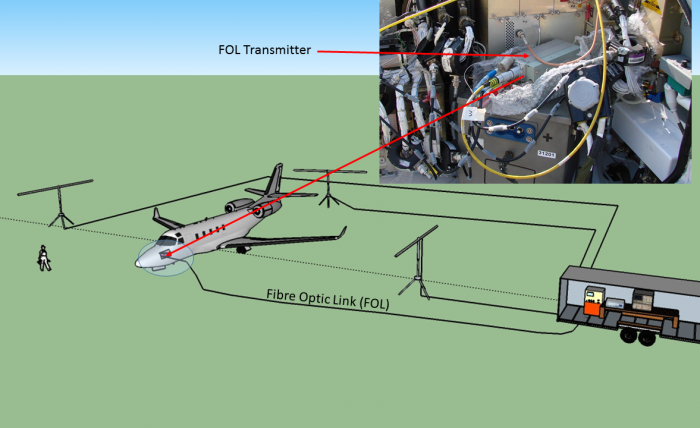 Interconnecting cables that pass from the external environment to the internal aircraft environment will impact measurements, for example RF current can flow on the cable shields. 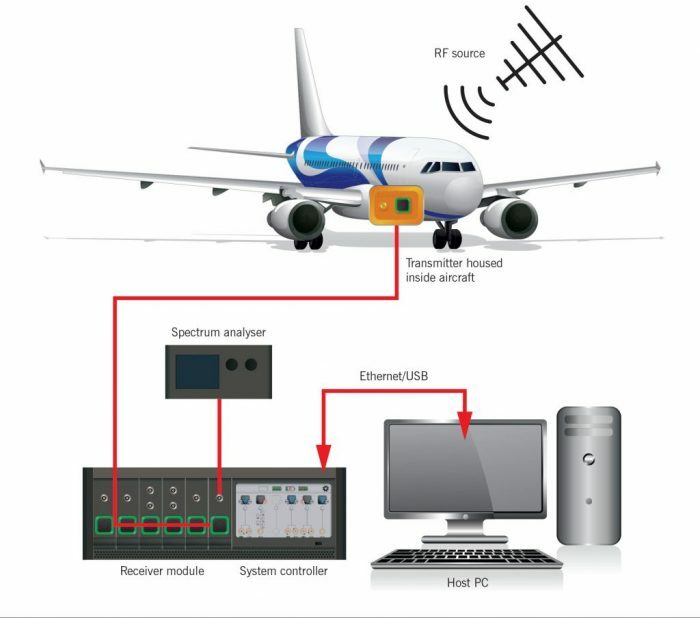 It is important therefore that signal cables are not used to connect the external instrumentation to the field/current/voltage probes installed within the aircraft, whilst performing frequency or time domain measurements. 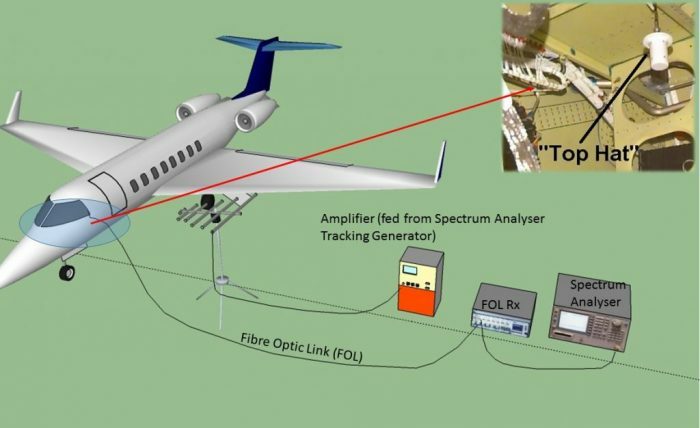 This is particularly significant over the 10kHz to 1GHz frequency range, where cable coupling dominates the leakage mechanism into the aircraft under test. The external instrumentation must be outside the measurement area which with large aircraft may lead to a separation distance of tens’s of metres. Signal loss then becomes a factor at higher frequencies. Such signal loss is also avoided by the use of a FOLs. A typical aircraft low level swept current measurement would require signal cables of 40 to 50 metres, introducing significant losses. FOLs are typically used with 100 or 200m link lengths, permitting signals to be coupled from the transducers installed on the aircraft to the measurement equipment for even large transporter/passenger aircraft, requiring fibre lengths of over 100m. The PTK enables easy yet precise displacement measurements of a system or tool, with up to two sensors, allowing system characterization and monitoring. Our displacement sensors are designed to detect and show micron-level displacements. By using two sensors the PTK can also provide relative displacement differences between two signals. The displacement sensors are able to tolerate aggressive mechanical environments, and are therefore uniquely suited for complete cycle measurements of processes like stamping and deep drawing. Here the PTK allows characterization of a complete tool cycle, as well as detection of any abnormalities such as lack of parallelism, slugs and similar. The User Interface screen shot below shows a PTK measurement of a stamping tool where slug and lack of parallelism of the tool were characterized. 0.5mm obstruction shown between 2nd and 3rd cycle as highlighted. The difference in peak height indicates a Lack of parallelism between the two measuring points of the sensors. What can the PTK do for you? The PTK is a cost competitive test instrument, for assessing the behaviour of your processes and tools, before investing in a full, integrated monitoring system in your production environment. 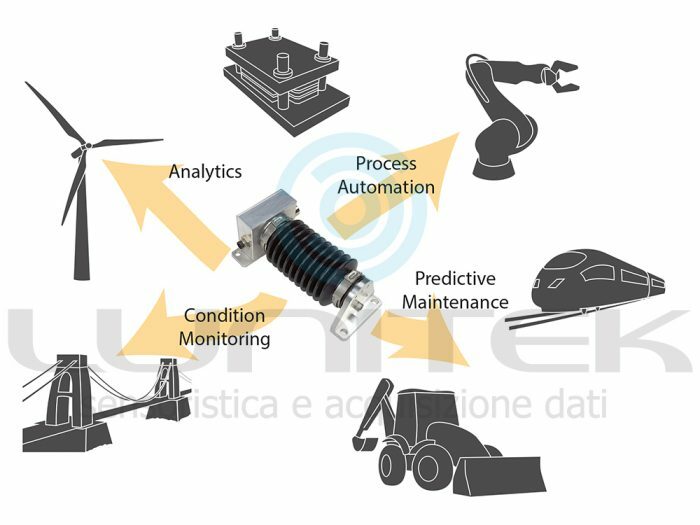 The PTK also enables you to characterize the dynamics of your machines and tools at different operation conditions to provide data/driven optimisation. The software associated with PTK is for Windows based devices. The software displays sensor measurements in real time as well as saving the data to a .txt file. The data can therefore be imported into Excel for analysis, presentation etc. The graph below shows a real application example where a PTK was installed in a progressive stamping tool to measure tools characteristics in presence of an obstruction (slug). The example shows a change in tool stroke characteristic due to a 0.03mm slug. 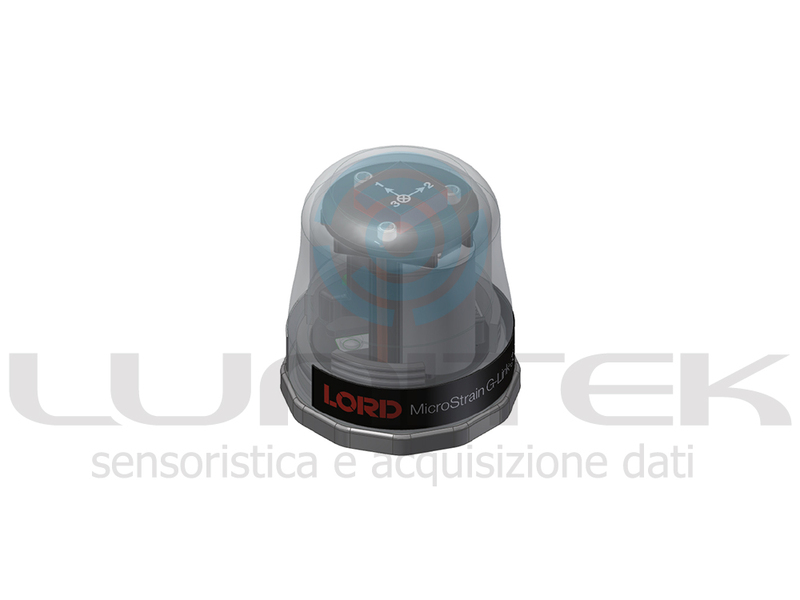 Being capacitive and highly elastic, the Electroactive Polymer (EAP) core is the highly accurate central element of our sensors. Being made solely from rubber also makes the sensor intrinsically tolerant of misalignments and high vibration levels. The G-Link-200-OEM has an on-board triaxial accelerometer that allows high-resolution data acquisition with extremely low noise and drift. Additionally, derived vibration parameters allow for long-term monitoring of key performance indicators while maximizing battery life. Users can easily program nodes for continuous, periodic burst, or event-triggered sampling with the SensorConnect software. 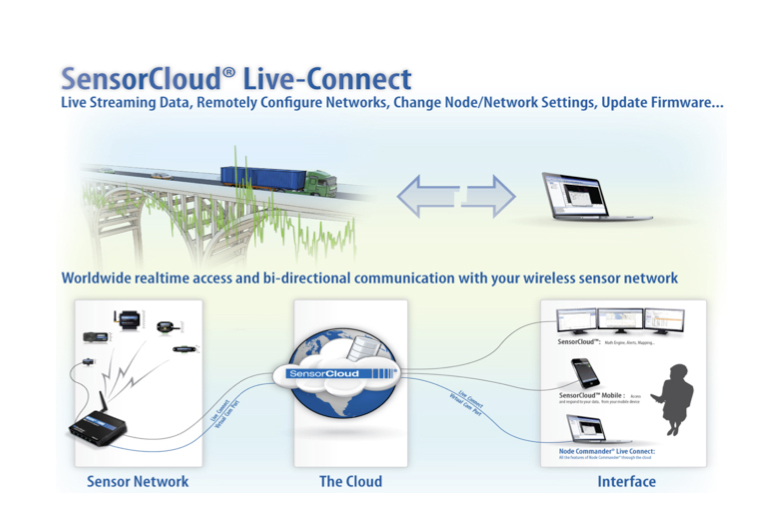 The optional web-based SensorCloud interface optimizes data aggregation, analysis, presentation, and alerts for sensor data from remote networks. Why should I monitor the health status of my building? A real-time system monitoring the vibrational characteristics of a structure allows to detect potential damage at the earliest possible stage, bringing considerably benefits and increasing the safety of the occupant. The reliability of the results is ensured both by the ad hoc sensors disposition and the calibrated calculation model, in which all the very own structural features of the building are taken into account. Structural health monitoring: How does it work? The use of sensors having high dinamyc range and low noise level, if combined with an advanced and dedicated software for signal processing and structural identification, guarantees the knowledge of the health status of the building in the strong motion phase as well as in its serviceability condition before and after a seismic event. 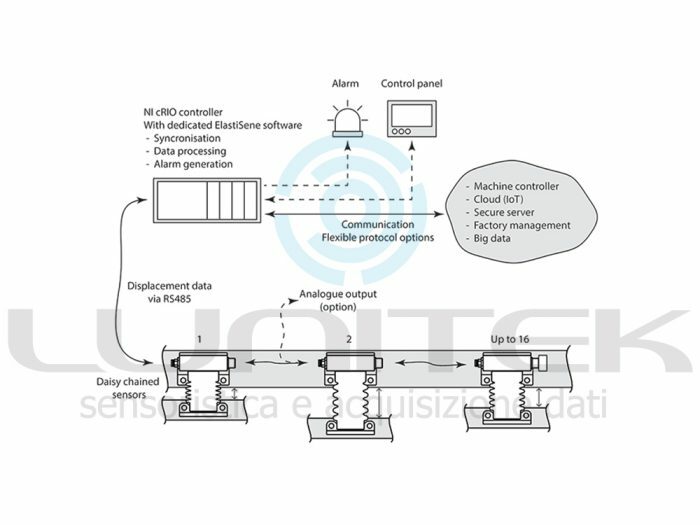 The software is in constant communication with the sensors, elaborating the signals in near-real-time and periodically extracting the modal parameters of the structure. These parameters can be considered like a «fingerprint» of the building and their changes over time can be used for an effective damage assessment. 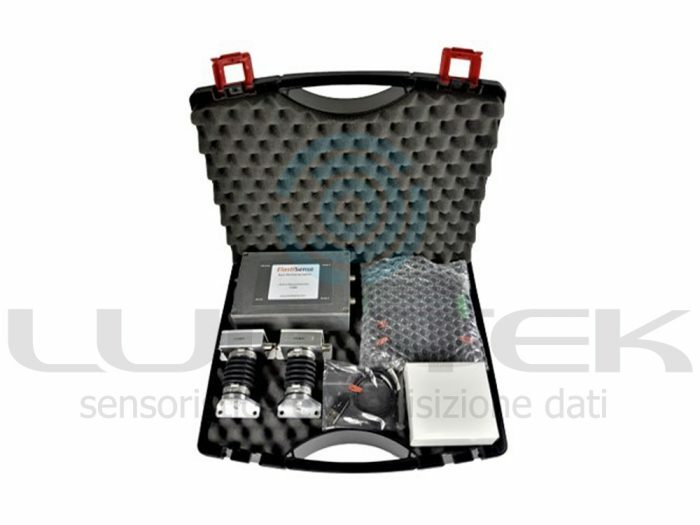 Each system is specifically calibrated on the related structure, in terms of both hardware (number of sensors and disposition) and software (implemented calculation model) in order to guarantee the reliability of the results. During the regular serviceability condition of the structure, ambient vibration measurements are acquired several times a day. Once signals are sent to the monitoring software, a dynamic identification analysis is performed through automatic algorithms that use the Operational Modal Analysis (OMA) techniques in order to estimate natural frequencies (w), mode shapes (A) and damping (n) of the building under its operating conditions. The methods for damage assessment that examine the changes in the vibration characteristics follow the basic idea that modal parameters depend on the physical properties of the structure. When a significant variation (Delta w) in the identified characteristics is detected, suggesting the occurrence of a potential damage in the structure, an automatic procedure is started to apply some damage identification methods by analysing the differences between the last modal characteristics and the last reference ones, assumed to represent the undamaged state of the structure. 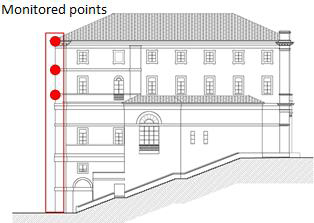 Identified parameters can also be used to calibrate a FE model of the building through Model Updating techniques, to make the model as closely as possible to the reality. During the seismic event, the system acquires the signal recorded by sensors placed on the ground outside the building, that are designed to provide the main strong motion parameters for the considered earthquake, i.e. Peak Ground Acceleration (PGA), Peak Ground Velocity (PGV), Peak Ground Displacement (PGD), Arias Intensity (AI) and Significant Duration (SD). 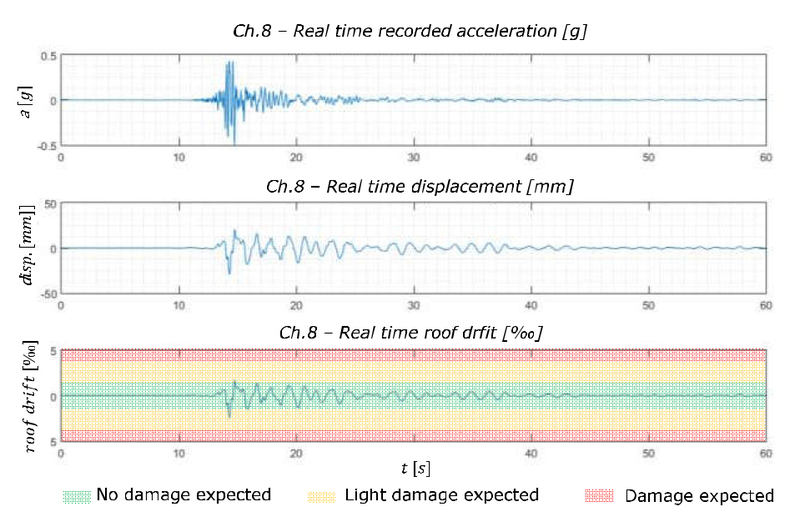 At the same time, the software acquires the signals of the sensors located on the structure in order to calculate the real time displacements and related inter-story drift ratios (IDRs) that occurred during the seismic event. As the IDR is one of the parameters that is mostly related to the structural damage, the software can instantly give a warning about a potential damage occurrence, using specific capacity curves that correlates the IDR values with the expected level ofdamage in the structure. During a seismic event, the deformations induced in the building result in a reduction of its natural frequencies, due to the nonlinearities in the material response. If no structural damage has occurred this frequency drop tends to be recovered as soon as the earthquake ends. 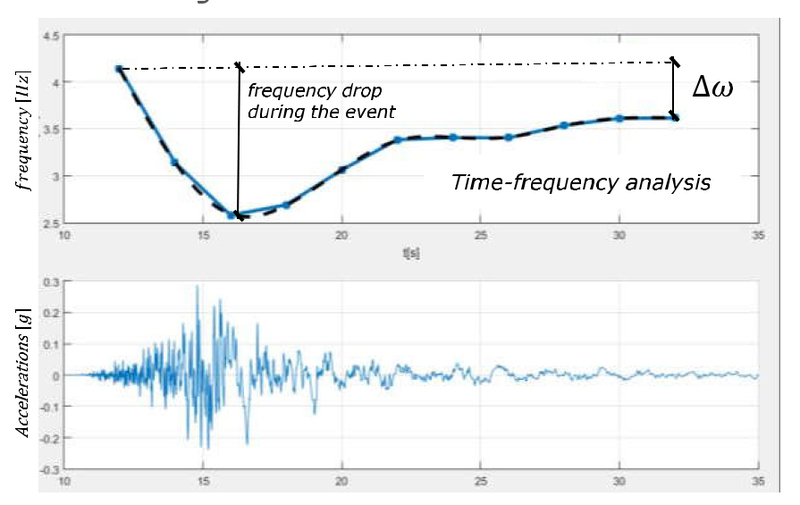 The monitoring software uses time-variant AutoRegressive exogenous (ARX) models in order to carry out a time frequency analysis, identifying the frequency drop during the event. 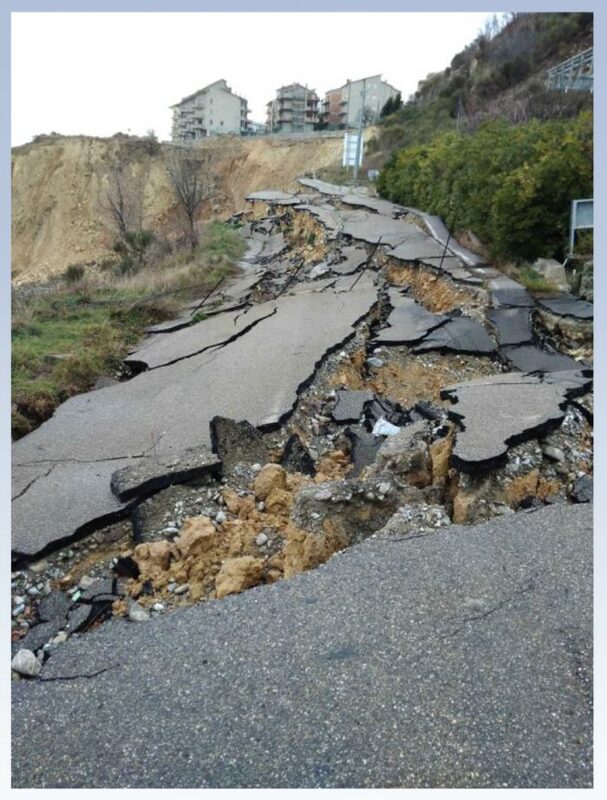 Monitoring the way in which the structure modifies its vibrational characteristics during a seismic event can be useful in the cumulate damage estimation. The goal of this work is to develop and deploy a network of long life, low-cost wireless strain sensors to monitor civil structures. Previous work on RF sensor nodes which transmit periodically to a central receiver using time division multiple access (TDMA) has been reported . With a low power sleep mode and 30 minute sampling interval, this system is estimated to operate for 5 years on one 3.6V Li-Ion AA battery. However, deployment of the TDMA system on structures underscored the need for a high-speed wireless sensor network with user-triggered and event-triggered data streaming capabilities. To this end, this prompted the development of a second generation datalogging transceiver (75 Kbps , 2MB memory). These systems provide 1KHz, 3-channel data in continuous streaming mode or 2KHz, 3-channel data in data logging mode. The node preserves battery life by entering a low power sleep state. The node periodically awakens and listens for commands, or wakes via eventtriggered interrupt. This high-speed system was installed on a heavily trafficked bridge in Vermont. 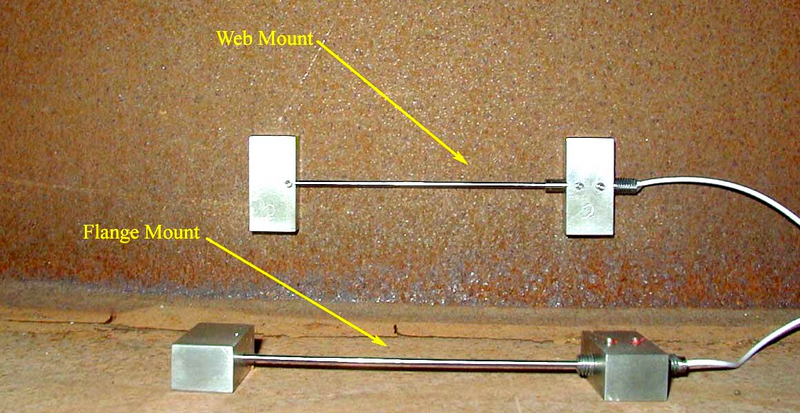 Displacement sensors were attached to steel girders for static and dynamic strain measurement. Strain data were acquired via a wireless link. The wireless system is designed to remain long term on the bridge for interrogation under normal and controlled operating conditions. * MicroStrain, Inc., 310 Hurricane Lane, Suite 4, Williston, VT USA 05495 U.S.A. Aging civil infrastructure presents a need for an inexpensive, easy to install strain monitoring system . Servicing and installation can form a large portion of the expense of such a system, since human access to civil structures often requires specialized equipment, liability insurance, and vehicle traffic control. Hard-wired systems increase this human access component, with the system distributed over a larger area on the structure. In contrast, a wireless strain monitoring system as shown in Figure 1, only requires access to desired measurement areas, reducing the human access component, and ultimately reducing the cost of implementation. The primary research goals were divided into two categories. 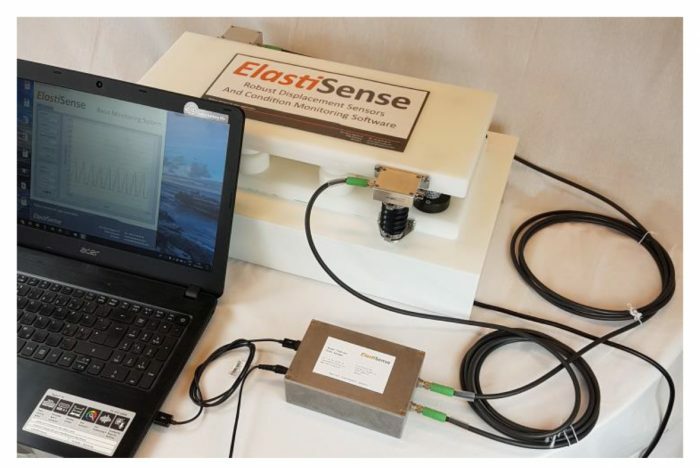 The first objective was to build a second-generation, high-speed wireless sensor network, based on a new datalogging transceiver platform. This platform adhered to the following design criteria: 1) high speed wireless sensor streaming 2) minimal, deterministic streaming latency 3) onboard, non-volatile, high capacity data logging 4) advanced sleep modes for long-term deployment 5) interfaces with quarter, half, and full bridge sensors 6) interfaces with magnetic mount DVRT displacement sensors. The second objective was to design a magnetic-mount attachment method for a high-resolution DVRT (differential variable reluctance transducer). The DVRT magnetic mount design would adhere to the following design criteria: 1) simple to attach to steel structures 2) no harm to surface of target structure 3) rugged construction for extended field use 4) highly resistant to slipping or migration due to ambient loads, such as vibrations. The datalogging transceiver platform was developed from off-the-shelf components, relying on IC’s (integrated circuits) for miniaturization and cost reduction. Figure 2 is a block diagram schematic. The platform has 8 channels of analog input. Channels one through four feature amplified full-differential input, with software programmable gain and offset, with optional bridge excitation and completion for interfacing full, half, or quarter bridge sensors, such as strain gauges and load cells. Channels five through seven provide non-amplified pseudo-differential input, accepting analog voltages between 0 and 3 volts. The last channel is reserved for an onboard solid-state temperature sensor (TC1046, MicroChip Technologies, Chandler AZ). The platform also features three 12-bit digital to analog converters that enable wireless bi-directional control applications. 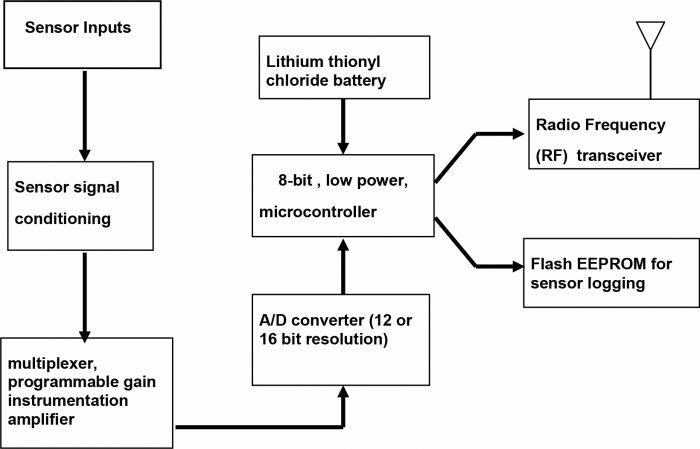 At the heart of the wireless sensor is a low power 8-bit micro-controller (PIC16F877, MicroChip Technologies) that collects sensor data via an 8-channel, 12- bit successive approximation A/D converter (MCP3208, MicroChip Technologies). This data can then be stored locally to an onboard 2MB flash memory chip (AT45DB41, Atmel Corporation, San Jose CA), or streamed wirelessly. If the latter collection method is chosen, a half-duplex, narrowband ASK transceiver (DR-3000-1 RF Monolithics, Dallas TX) sends the sensor data at 75 Kbps, over a 916.5 MHz carrier. On the user/controller-end, a base-station with the same telemetry hardware receives the incoming data stream, and forwards the data to a PC via a standard RS- 232 serial port. Since the telemetry hardware is bi-directional, the base station can also send commands and data to the remote nodes. This allows the user to reconfigure the operational parameters of the nodes wirelessly, and trigger data collection sessions. The network topology was implemented as a single-hop, hierarchical model, capable of supporting hundreds of nodes per base-station. Combined with the welldefined behavior of the narrowband RF transceiver, the topology enabled a minimal and deterministic sensor streaming latency. The system latency was measured to be less than 2 ms by measuring the time between an A/D sample on the remote node, and reception of this data on the serial port of a PC. Wireless sensor streaming occurs at a fixed rate of 75 Kbps, which allows for approximately 1700 data points per second, depending on the number of active channels. This relationship is shown in Table 1. Error detection is accomplished with a checksum byte for each sweep (defined as a frame containing a sample of each active channel). This error detection scheme was chosen due to its low overhead requirements, which allowed for greater data throughput. important to develop a communications protocol that minimizes radio usage on the remote node. Table 2 lists the power requirements of the wireless sensor. (All measurements are taken when interfaced to a single 1000-ohm full bridge strain gauge sensor). It was also important to implement intelligent sleep states, since the nodes would remain on the bridge for large periods of time without user-interaction. The microcontroller on the remote node features a low power sleep mode that can be exited via a watch-dog timer, or an external interrupt. This enabled two low-power monitoring modes. In the first mode, the microcontroller periodically awakes via a watchdog timer interrupt, turns on the telemetry hardware, and listens for a wake command from the base station. If it does not detect a wake command within 50msec, it returns to the same sleep mode. In the second mode, the microcontroller remains in the low power sleep mode until a rising external analog voltage triggers a hardware interrupt. 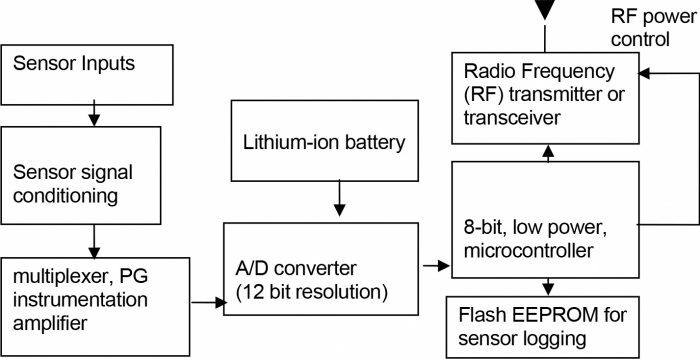 For the first anticipated test application (scheduled monitoring of strain on a bridge), the following design assumptions were used to estimate battery life. The bridge is to be inspected once a month, requiring that the remote nodes collect data for approximately two hours per session. In addition, the nodes would need to remain in standby mode for six hours during these twelve scheduled inspections. Based on these requirements, the nodes were equipped with a 3.6V, 19 amp-hour, lithium thionylchloride battery (D-Cell, Tadiran Lithium Batteries, Port Washington, NY) which should last an estimated three and a half years. neodymium magnets for attachment. The magnets are shielded from the sensor by a 416 stainless steel cup. This cup concentrates the flux lines and increases the holding power to about 45 N.
configuration, one microstrain experienced over the 100 mm of substrate corresponded to 100 nanometers of core displacement. A machined aluminum spacing jig was used as an installation tool that guaranteed consistent spacing and angular alignment while allowing the core to slide freely, Figure 4. For long-term stability, the attachments between the sensors and the steel beam must remain in permanent contact with no relative motion at the contact pads. The shear force resistance of the attachments was tested by applying a shear load with a calibrated “S” type load cell (Model 363, Revere Transducers, Tustin CA) and reading the DVRT output. When the applied shear load is high enough to move the attachment pad, the DVRT core begins to move within the sensor and is detected. Multiple types of changes in the interface between the metal attachment and the substrate were also tested, with the idea that a high friction interface would make the magnetic attachments hold even better. A diamond knurl pattern was machined directly onto the base of the stainless steel attachment. This knurl pattern significantly increased the coefficient of friction between the attachment and the substrate under test, and the reactive force was increased from approximately 9 Newtons to about 13 Newtons. This design was deemed to be the best candidate for use in field-deployable sensors. Data were collected with both a magnetic mount DVRT sensor and a half bridge bonded foil strain gauge (1000 Ohms, Micro-Measurements, Raleigh, NC) mounted on a cantilevered steel beam (5.08cm x 0.64 cm, constant cross section). The beam was resonant in bending at ~20 Hz. To initiate a test, the beam was flexed and then released, creating a cyclic bending strain which exponentially decayed. The strain levels were approximately +/- 200 microstrain (peak-to-peak). Analog voltages from the DVRT signal conditioning and the strain gauge conditioner were recorded by a digital storage oscilloscope. Figure 5 is photograph of this test setup. To determine the offset and span coefficients of the DVRT strain gauge, two test methods were employed. The first utilized an Invar block, to which the DVRT was affixed with magnetic mounts. Data were collected with the DVRT core removed, and with the core at two known physical displacements from the null position. The DVRT, its signal conditioning and its wireless digital transmission circuitry were placed inside an environmental chamber with programmable temperature controller (Thermotron). Data were collected for these conditions at 20, 10, and 0 deg Celsius. From these data, we were able to compute the system offset drift and system span coefficients independently of the linear expansion coefficients of the substrate to which the DVRT’s magnetic mounts were affixed. To determine the effect that magnetic mounting of the DVRT on a steel substrate may bhave on the thermal coefficients, tests of the DVRT and strain gauge instrumented 4140 steel cantilever beam were also performed. The DVRT and instrumented cantilever beam were placed within the environmental chamber, and their requisite electronics were placed outside of the chamber. This strategy allowed us to focus on the DVRT’s contribution to thermal errors, by direct comparison to the bonded foil strain gauge. 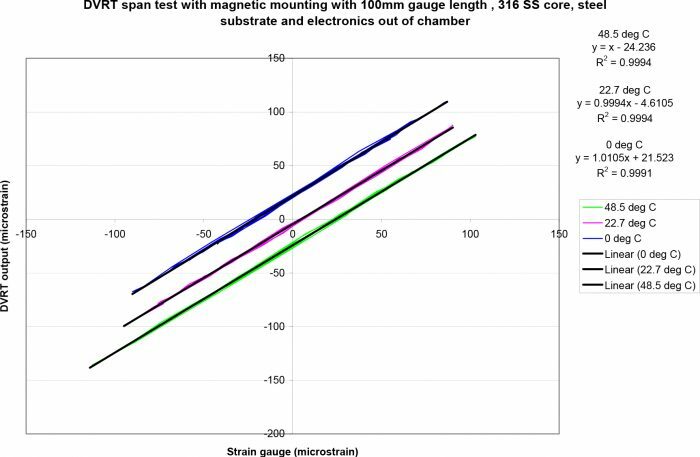 The magnetic mount DVRT strain gauge’s performance was comparable to that of the conventional bonded foil strain gauge, as shown in Figure 6. 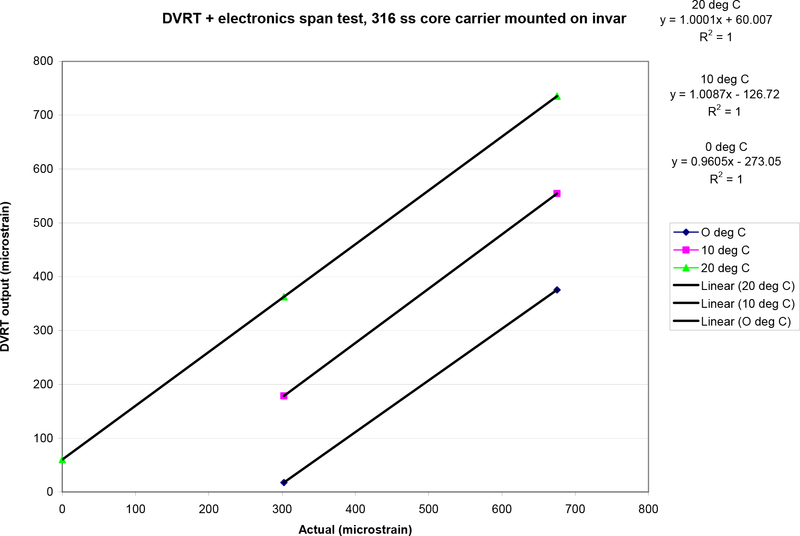 The DVRT data are plotted as a function of the strain gauge data, and correlation coefficient (.9978) presented. Note that these data represents several complete cycles at the 20 Hz test frequency. The data indicate minimal hysteresis or phase lag, and the relationship of magnetic mount DVRT data to conventional bonded foil strain gauge data is very nearly linear. The results from the thermal tests of the magnetic mount DVRT, its signal conditioning and its wireless digital transmission circuitry system on an Invar block at various temperatures is plotted below in figure 7. The DVRT output is plotted on the vertical axis, in microstrain, by scaling its displacement output using its calibration coefficient and gauge length (100mm). The horizontal axis represents fixed Presented at 4th Int’l Workshop on Structural Health Monitoring Stanford University, Stanford CA, Sep 15-17, 2003 displacements measured using the DVRT’s output at room temperature. Slopes and offsets were calculated for the three temperatures tested. The temperature coefficient of span was -0.086%/ °C between 20 and 10 degrees Celsius and 0.482% between 10 and 0 degrees Celsius. The offset shifts were 18.7 microstrain per degree Celsius between 20 and 10 degrees Celsius and 14.6 microstrain per degree Celsius between 10 and 0 degrees Celsius. This offset shift may be largely attributed to the core material, which is comprised of hardened 316 stainless steel. The thermal expansion coefficients of this material ranges between 16 and 17.8 microstrain/ degree Celsius (Micro-Measurements, Raleigh, NC). The results from the thermal tests of the magnetic mount DVRT and strain gauge instrumented 4140 steel cantilever beam are presented below in figure 8. The DVRT output is plotted on the vertical axis, in microstrain, by scaling its displacement output using its calibration coefficient and gauge length (100mm). In bending an additional scale factor is applied to account for the DVRT’s distance from the neutral axis of the beam which is greater than the surface location of the bonded foil strain gauge. 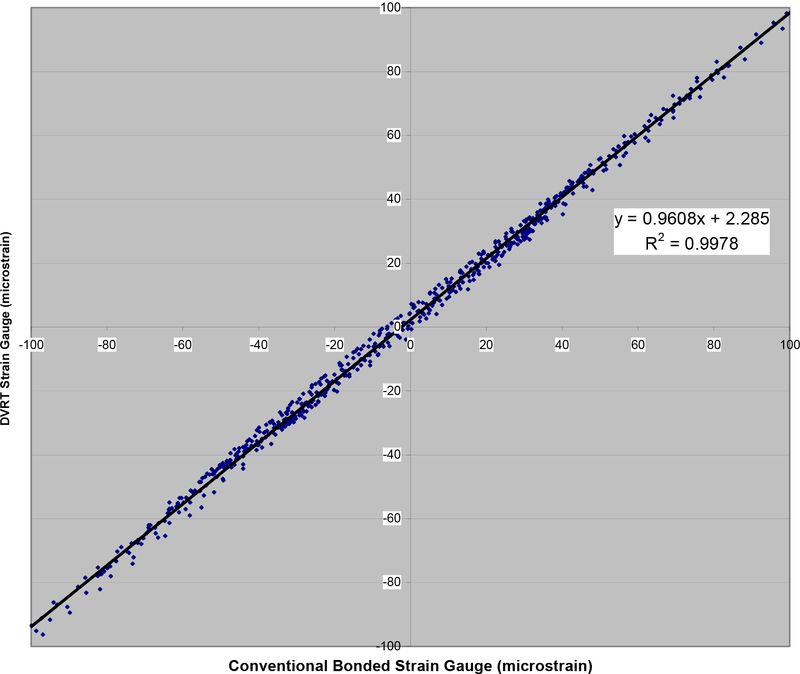 On the horizontal axis we plot the output of the bonded foil strain gauge. A shunt calibration was performed to convert its signals in to units of microstrain. The temperature coefficient of span was 0.0023%/ °C between 22 and 50 degrees Celsius and -0.05% between 22 and 0 degrees Celsius. The offset shifts were -0.76 microstrain per degree Celsius between 50 and 22 degrees Celsius and -1.15 microstrain per degree Celsius between 22 and 0 degrees Celsius. These results indicate that the DVRT has a relatively low temperature coefficient of span compared to the DVRT with its requisite signal conditioning. Compensation for the signal conditioning span error is warranted. One strategy is to implement an automatic shunt calibration. The results also indicate that the temperature coefficient of offset is much lower for the DVRT combined with a steel substrate as compared to the DVRT on the Invar substrate. The apparent decrease in offset temperature coefficient on steel may be largely attributed to the linear expansion coefficients of construction steel which is between 10.8 and 12 microstrain per degree C, and begins to approach that of the DVRT stainless steel core. Offset and span errors may be corrected in software by use of an on-board semiconductor temperature sensor (MicroChip model 1046, Chandler, AZ) and an appropriate software correction algorithm which may reside in the remote units microcontroller or may be applied in a post processing routine. The first field-trial involved placing several datalogging transceiver nodes and magnetic mount DVRT’s on a heavily-trafficked steel girder composite deck bridge spanning the LaPlatte River in Shelburne, VT. 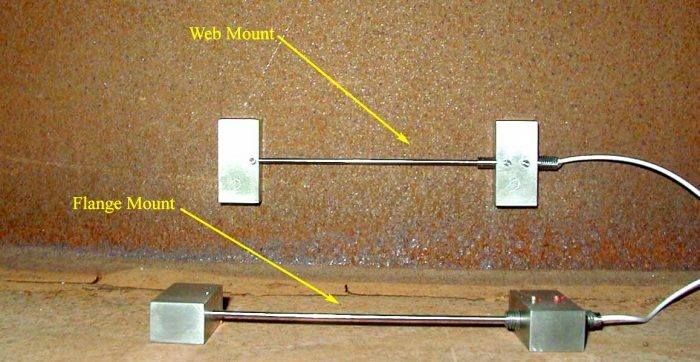 The magnetic mount sensors were placed on the bottom flange of the central beam, and also near the bottom of the beam web, as in Figure 3. Installation of each sensor required less than five minutes. The base station was connected to a laptop computer, located approximately 35m away from the sensor nodes. The noise floor measured with no vehicle traffic (+/- 1.5 microstrain) was slightly higher than expected. However, with heavy traffic on the bridge, the system successfully collected and transmitted data. 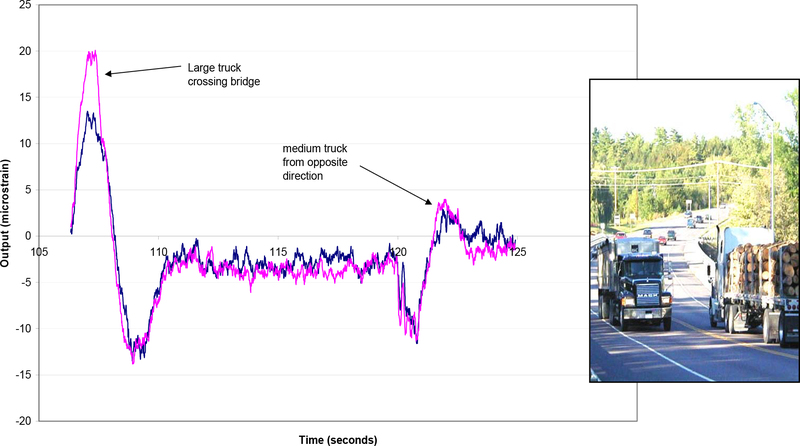 Figure 6 shows data collected while two large trucks traversed the bridge, each traveling in opposite directions. time, with a collecting strain data at 2 kHz with a resolution of +/-1.5 microstrain. The first field trial was successful. The system is currently undergoing long-term testing to evaluate reliability, drift, and environmental resistance. Enhanced signal conditioners are under development which provides improved thermal stability under harsh operating conditions. This material is based upon work supported by the National Science Foundation under Grant No. (0078617, 0110217). 1. C.P. Townsend, M.J. Hamel, P. Sonntag, B. Trutor, J. Galbreath, and S.W. Arms. 2002. “Scaleable, Wireless Web Enabled Sensor Networks” Sensors for Industry, 2002 Conference. 2. Huston, D. 2001. 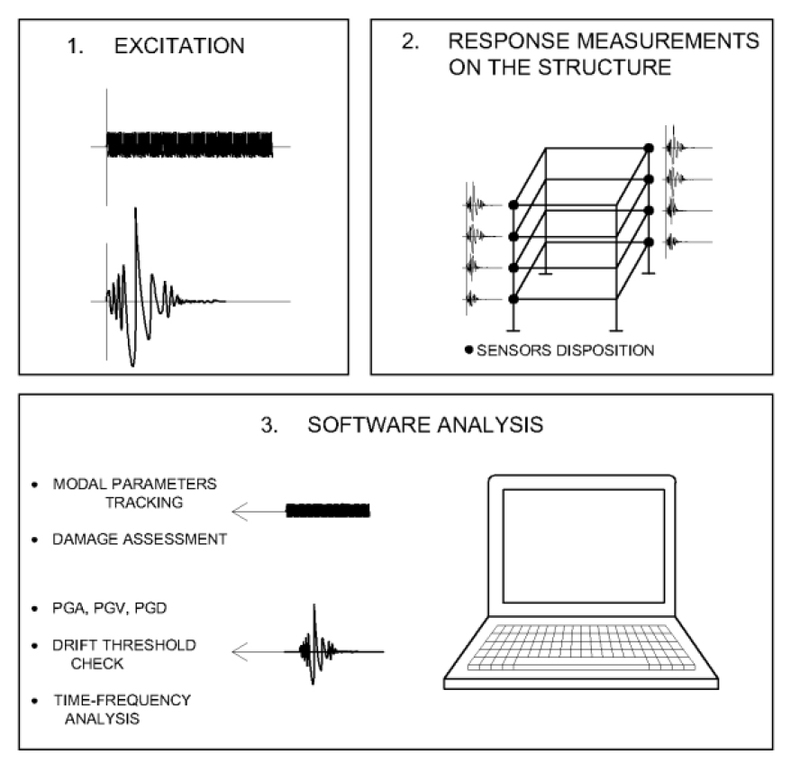 “Adaptive Sensors and Sensor Networks for Structural Health Monitoring”, Proc. SPIE Complex Adaptive Structures, 4511:203-211. Annual International Conference on Mobile Computing and Networking. 272-287. 4. Hartog, J.P. 1985. Mechanical Vibrations, Dover Edition. McGraw-Hill, New York, pp. 63-64. 5. D. C. Guzik, C.P. Townsend, S.W. Arms. 1998. “Microminiature High-resolution Linear Displacement Sensor for Peak Strain Detection in Smart Structures”, Proc. SPIE Smart Structures and Materials, 3330:30-35. Wireless sensors can improve our ability to monitor critical civil infrastructure, including highways & bridges. We have previously reported on highly miniaturized, wireless strain, acceleration, and inclination sensing systems capable of providing low & high speed data update rates. Signal conditioning, multiplexing, A/D conversion, processing, amplifying, data logging, and bi-directional wireless communications are fully integrated. Each node includes a unique address (RFID), allowing a single base station to orchestrate data collection from thousands of distinct sensing nodes. remove offsets from a node’s channel, increase gain on a node’s channel”. 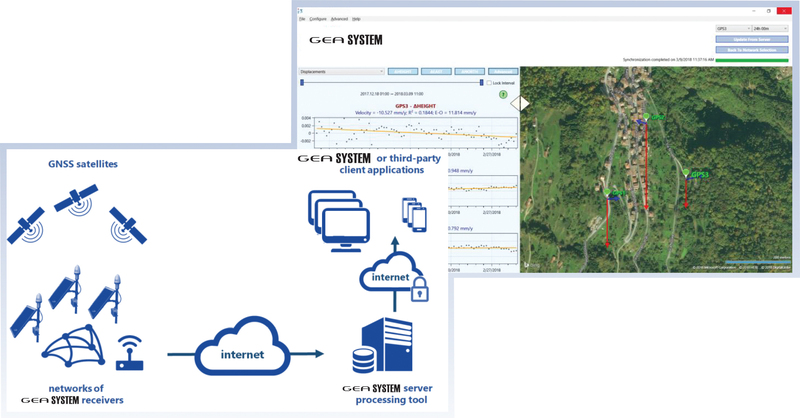 These capabilities allow a remote sensing network to be deployed in the field and remotely adapted over time to meet the customer’s unique SHM requirements. the installed wireless sensing nodes without being forced to directly connect to each node. The ultimate convenience is to provide the end user with the capability to reconfigure the wireless sensing network without leaving their office. 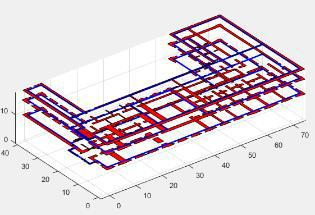 The objective of this paper is to describe the methodology used to develop a modular wireless sensor network capable of wireless reprogramming over a long distance cellular phone network. This system would allow an end user to gain control over a complete wireless sensing network from their office – from distances of thousands of miles away from the monitoring site where the sensing network is actually deployed. A concept drawing is provided in Figure 1, below. Figure 1. Wireless strain sensing nodes distributed over the structure report data to one or more base stations located near the structure. A cellular phone link from the base station allows the sensing network to be controlled and re-programmed to meet the needs of the application from an office located anywhere in the world. A functional block diagram of a versatile wireless sensing node is provided in Figure 2, below. A modular design approach provides a flexible and versatile platform to address the needs of a variety of applications. For structural health monitoring (SHM) applications, wireless tri-axial accelerometer nodes and wireless multi-channel strain gauge nodes are frequently deployed. Wheatstone bridge sensor input offsets may be removed using software commands. Bridge completion resistors for quarter and half bridge strain sensors may also be included, allowing a wide variety of strain gauges installations to be accommodated. Modules may also provide software programmable gains. The bi-directional radio link may be reconfigured in software (frequency and RF power levels) as required for given applications’ wireless range requirement and in order to conform to specific radio communications standards for a particular region of the world. Each node contains a unique 16 bit address within its non-volatile memory. This scheme allows up to 65,536 (2^16) wireless sensing nodes to be deployed on the wireless sensor network. An important strategy to save power is to remotely command the wireless sensing nodes from a base station as required by the specific application. We have previously reported on addressable, wireless strain sensing nodes that respond to base station broadcast address and/or node specific address commands, including commands to sleep, wake up, log data, and stream data continuously [2,3]. However, our previous base station designs could not be controlled from a remote personal computer platform using cellular phone networks. 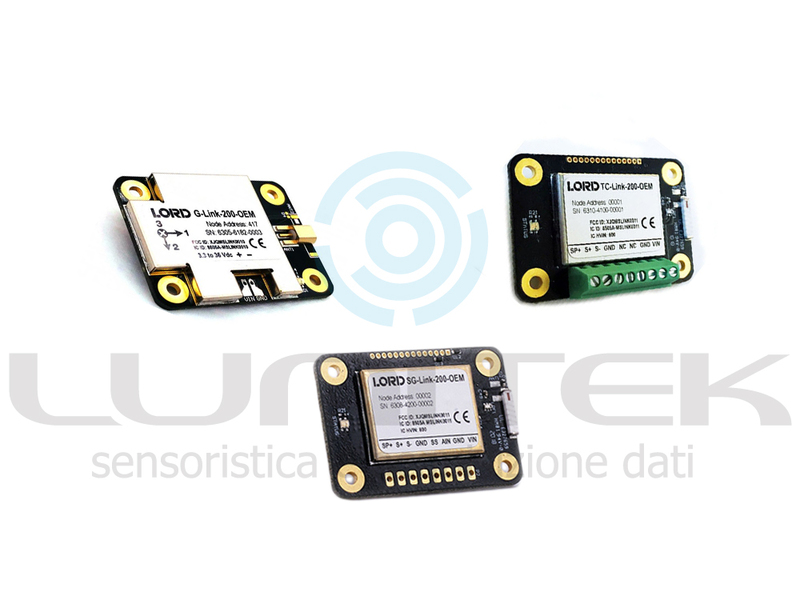 These addressable sensing nodes feature two Megabytes of on-board, non-volatile memory for data storage, 2000 samples/second/channel logging rates, 1700 samples/sec/channel over-the-air data rates, bi-direction RF link with remote offset and gain programmability, compact enclosure, integral rechargeable Li-Ion battery, and on-board temperature sensor. Figure 2 provides a photograph of a wireless strain sensing nodes packaged within an IP67, NEMA 4X rated environmentally sealed outdoor enclosure. The package includes neodymium magnetic mounts to provide easy mounting to steel structural elements. Cable glands allow lead wires from multiple strain gauges to enter the enclosure while maintaining the integrity of the water tight seal. We have used weldable strain gauges (350 ohms, quarter bridge, Micro-Measurements) with good success. These gauges are well protected from the environment and can be installed very quickly using a portable, battery powered spot welder. In order to facilitate data collection, triggering, and programming of the wireless sensing nodes, a base station was placed on the structure within 160 meters (500 feet) of the sensing nodes. Figure 3 also depicts the Base Station, which was housed in a heated NEMA 4X enclosure and contained a digital radio receiver with RS-232 output, Panasonic “Toughbook” personal computer (PC), 802.11b WiFi card with PCMCIA interface to the notebook PC, and cellular telephone with modem interface. The base station was connected to a local power source (110 VAC) through an uninterruptible power supply to prevent loss of power during temporary outages and to protect against power drop out and/or surges. 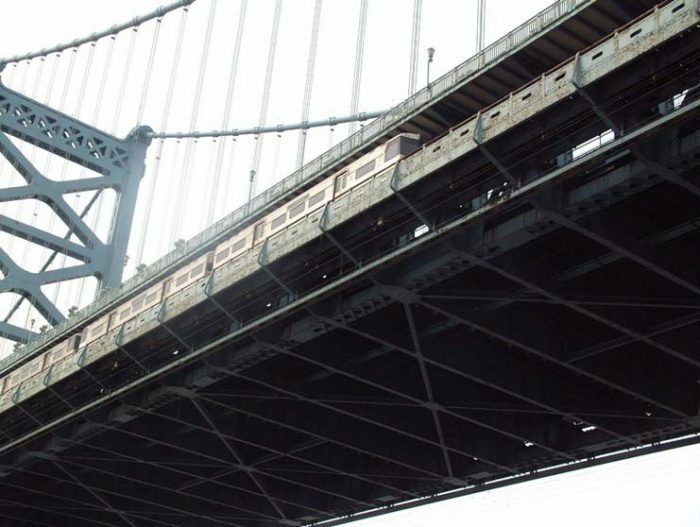 The system was deployed on a large civil structure in North America: the Ben Franklin Bridge, spanning the Delaware River from Camden NJ to Philadelphia, PA. The system was designed to acquire strain data when trains passed on the bridge, but this required that the trigger levels be optimized for each strain sensor placement. 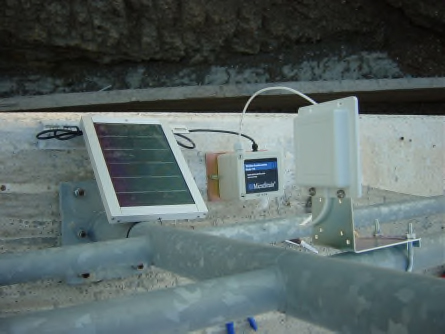 The WiFi card allowed us to gain control of the system from under the bridge, which proved helpful when the triggering parameters were initially set up. The cellular phone interface was intended to provide a greater level of programmability and distant (remote) access into the wireless sensing network. The cell phone interface also allowed data to be copied or moved from the notebook computer platform on the bridge to another computer (or server) located on the local area network where another cell phone was used to establish the connection. The following figures (nos. 4-9) are screen shots from the Base Station (PC side) and “Strain Wizard ™ ” software used to configure & calibrate the nodes remotely, using bi-directional wireless communications as required for an SHM applications. The software was written for use on Windows 95/98/2000/XP platforms. Figure 3. Wireless Sensing Nodes (4) in sealed NEMA 4X enclosures (top of photo). 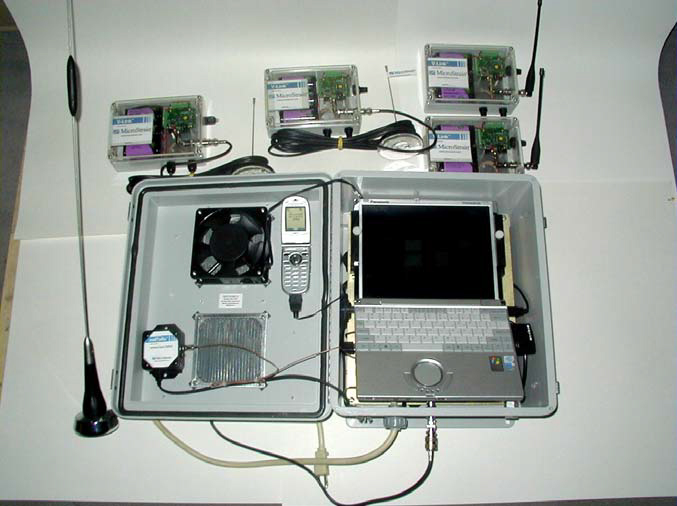 Base Station with Panasonic Toughbook ®, cell phone, 802.11b WiFi card, and narrowband RF Transceiver as packaged within sealed, thermally controlled enclosure (at bottom of photo). Figure 4. Software interface (on right) used to manually set up the number of active channels, as well as the offset and gain values for specific sensors on a channel-bychannel basis. The end user can also request that the software “sample” a specific channel on the wireless node to obtain an instantaneous snapshot. Figure 5. Software interface (on left) used to control sleep intervals between checks for commands from the base station. 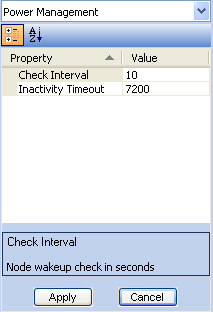 The inactivity timeout allows the node to go into micropower sleep mode if no commands or event triggers are detected. Figure 6. 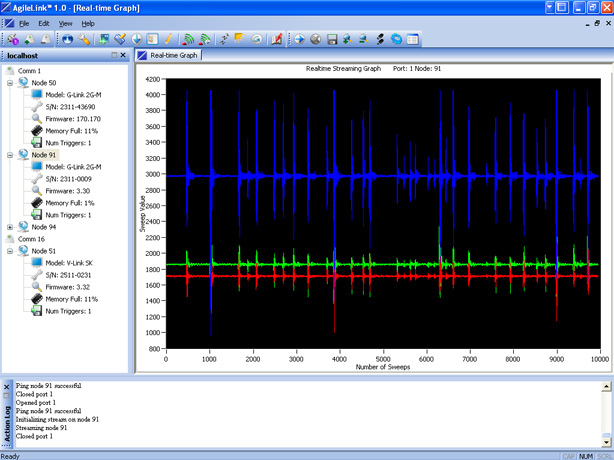 Software interface (on right) used to set up the sampling parameters of a specific wireless node on the network, specifically the sweep rate and total number of sweeps. 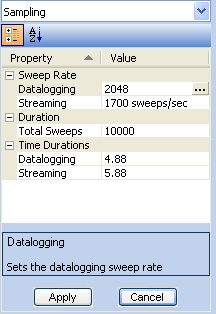 The program automatically calculates the duration of the sample based on these two parameters for both data logging and streaming modes. Figure 7. 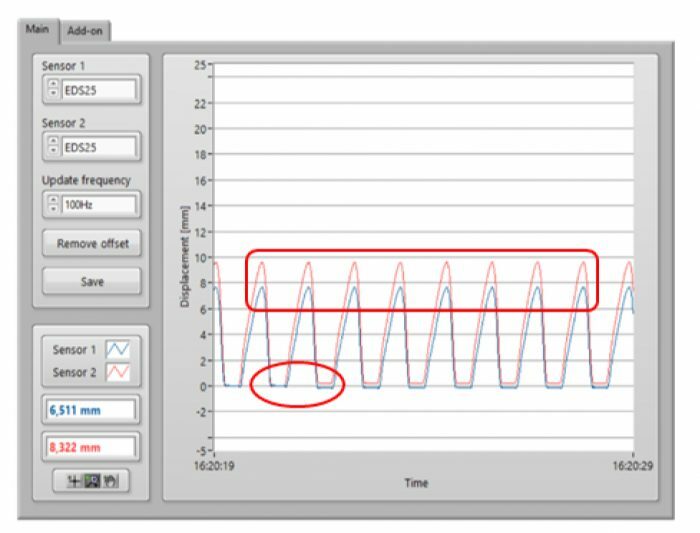 Software interface to provide the user with requisite gain and offset values after the remote balancing & shunt calibration steps have been performed. Figure 8. 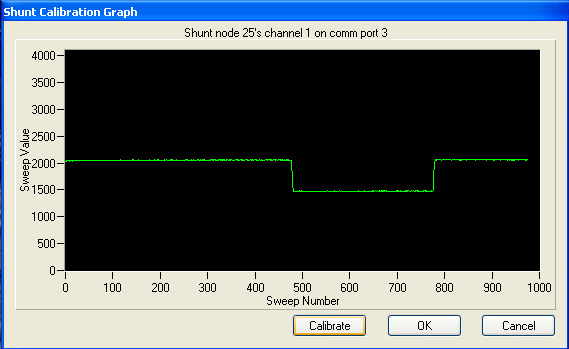 Software interface to indicate results of remote (wireless) shunt calibration of a specific node on the wireless network. In this case, node 25 has been shunt calibrated. Figure 9. Software interface to display real time streaming data on a continuous basis from a specific node on the wireless network. In this case, node 91 reports in real time. Integration of cell phone and PC display redirection technologies provide remote base station control and node configuration options wherever cell phone coverage is available. The remote connection software engages in directly connecting to the internet based on the Microsoft Task Scheduler (Redmond, WA). This scheduling software allows the user to define when an internet connection should be established in a myriad of schemes ranging from set intervals such as weekly, daily, or hourly or exact time and date instances such as every second month at three in the morning. During each connection session, an email is sent to a list of recipients containing detailed information on the base station’s internet location. This email list remains persistent amid system reboots as the list remains stored in the Window’s system registry and is editable via the remote data acquisition software. The user is provided with a window of opportunity (15 minutes) to connect to the base station, at which time they may cancel the automatic disconnect event and remain linked to the base station for as long as they desire. Connecting to the base station is executed through the use of remote display redirection software titled RealVNC; software initially developed by AT&T Laboratories in Cambridge, England and now available as open source. Through the assistance of this virtual network computing software, the user may operate on any aspect of the wireless network available to them as though they were physically in front of the base station’s PC. Upon expiration of the allotted connection window with no connection establishment or an explicit disconnect by the user, the cell phone line severs its link and attempts internet connection at its next scheduled time. A versatile wireless sensing system with remote reprogramming capabilities has been built and demonstrated. The graphical user interface may be controlled remotely using a cellular telephone interface. This system has potential to be used for advanced, remote condition based maintenance & structural health monitoring for a wide variety of machines and civil structures. A full system installation including ten wireless strain & temperature sensing elements, and two cell phone enabled base stations has been completed on the Ben Franklin Bridge, which is a major span crossing from Camden NJ, to Philadelphia, PA (Figure 10, below). The bridge is remotely accessible via remote software as described in this paper and is currently reporting strain data when passenger trains cross the bridge. Figure 10. The Ben Franklin Bridge spans the Delaware River, with ten strain sensors periodically checking strain levels on a continuous basis at ~1 Hz sample rates. The presence of a passenger train creates a change in strain rate, which triggers automated data acquisition at 32 Hz sample rates by the wireless strain sensing nodes. The authors are grateful for the partial support from the National Science Foundation’s SBIR program. We also want tothanks to the Delaware River Port Authority in Camden, N.J., which provided us with the opportunity to demonstrate our systems on the Ben Franklin Bridge. The structural performance of bridges is highly dependent on a variable combination of local conditions, use profiles, and design parameters. There are currently more than 600,000 bridges in the United States.1 According to the Federal Highway Administration (FHWA), one out of every four bridges is categorized as either structurally deficient or functionally obsolete. Yet, existing inspection-based maintenance procedures do not adequately address the growing sustainment cost and safety concern related to this aging infrastructure. In order for the Nation’s bridge network to support long-term use at a feasible cost, future bridge management initiatives will require scalable, high-resolution health monitoring and modeling capabilities. 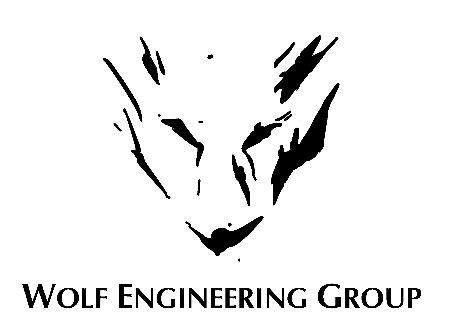 been shown to improve deterioration modeling, validate life-cycle cost analysis, and support the development of next generation Bridge Management Systems. long runs of wiring from each sensor location greatly simplifies system installation, enhances reliability and allows large arrays of sensor nodes to be rapidly deployed. 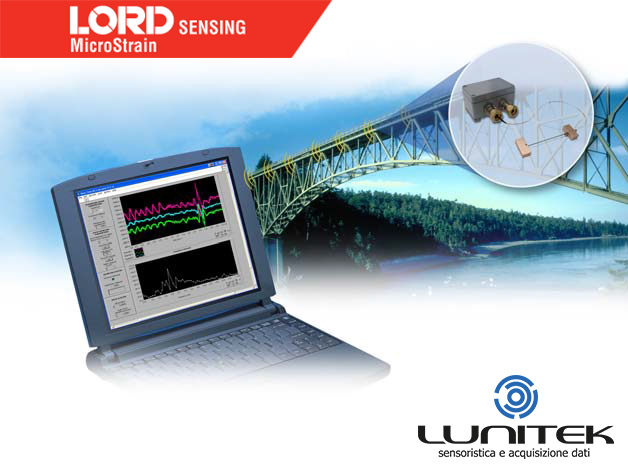 As a leading developer and manufacturer of wireless sensor solutions, MicroStrain is uniquely positioned to address the performance monitoring needs of bridge infrastructure. independent sensor platform for streamlined installation and reduced battery maintenance. Wireless capabilities eliminate the cost and installation burden of cabling. As a result, sensors can be quickly deployed in discrete locations with less disruption on traffic and concurrent construction. Additionally, a cloud-based management and modeling tool supports any MicroStrain wireless or third party health and usage data. Current commercial applications include bridges, aircraft and manufacturing processes. These include civil bridge projects2 and defense aircraft applications3, and they provide significant innovation in these areas. Advanced data synchronization capabilities ensure wireless aggregation of sensor information using time as a unifying variable. Ultra-low power FRAM memory and event driven triggers on each node allows the network to capture key health and usage information with less energy. Additionally, scalable system characteristics support the distribution of many sensors in a single network. Networks support landline, cellular or satellite communication. Virtually any sensor can be used with the MicroStrain network. As a result, operators can tailor monitoring to provide their necessary channels. Wireless nodes enable discrete placement without labor intensive and damage prone wire trails. The network supports detailed inspection, periodic evaluation, and long-term monitoring. Additionally, for new construction, Wireless Integrated Shear Pins (WISP), first designed to monitor loads, fatigue, and damage on aircraft landing gear, provide fully calibrated, environmentally sealed integrated performance monitoring capabilities. MicroStrain’s miniature wireless nodes are also capable of synchronized data acquisition from accelerometers, geophones, bonded or welded strain gauges, LVDTs, thermocouples, and corrosion sensors. 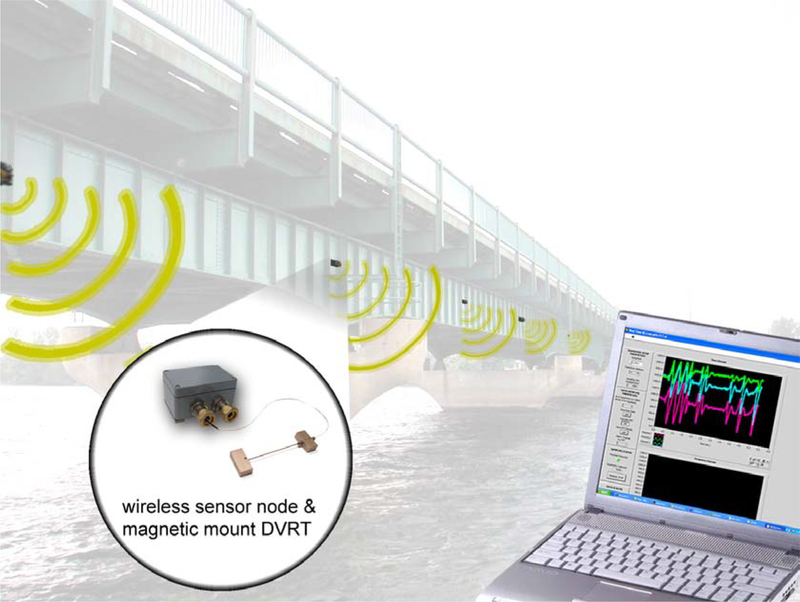 Automated bridge monitoring from remote sites is supported by our wireless sensor data aggregators (WSDAs), which collect data from the scalable sensor network using time as a unifying variable. The deployment of a self-powered miniature sensor can significantly enhance data extraction capabilities while simultaneously reducing the need for visual inspections and battery maintenance. SensorCloud™ makes big data highly accessible and allows engineers to drill down on individual data points in seconds. SensorCloud™ is equipped with on-board analytical and modeling tools to allow users to develop, verify, and validate new algorithms. Furthermore, the open API platform supports importation of analytical metrics and additional data types (such as annotative notes and images.) By these means, usage patterns such as number of crossings, average daily load traffic, resonant frequency, and cumulative fatigue can be leveraged over the long-term for more effective resource prioritization. As a result, users can configure, manage and maintain distributed monitoring systems more efficiently and at a lower cost. 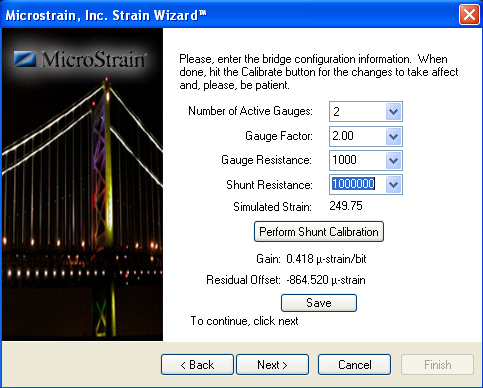 MicroStrain’s Live Connect also enables bridge operators to remotely monitor live bridge performance during controlled testing events. 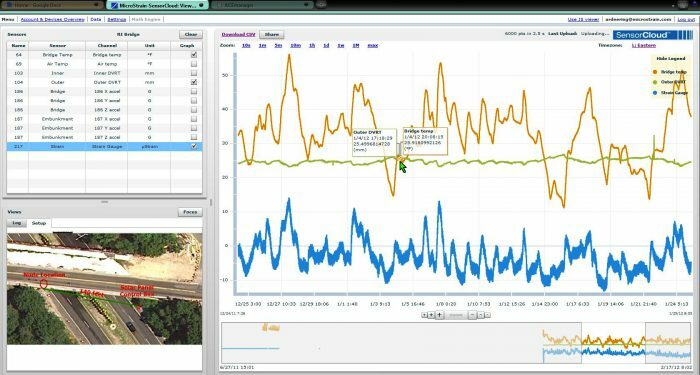 Leveraging strain events, such as the defined crossing of traffic loads, the performance of specific locations can be remotely observed in real time. 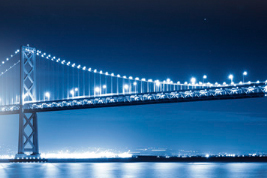 MicroStrain has supported numerous major wireless installations that actively monitor the structural strains and seismic activities of major bridge spans. 4 , 5 One example is the Ben Franklin Bridge that spans the Delaware River from Philadelphia, PA to Camden, NJ.6 The wireless monitoring system was accessed remotely over a cellular telephone link. The wireless nodes measured structural strains in the cantilever beams as passenger trains transverse the span. Measurements were taken over several months to quantify bridge fatigue. Performance monitoring validated that the bridge was operating within its designed range, and allowed operators to avoid a costly overhaul. MicroStrain has also deployed self-powered wireless bridge monitoring system for state, federal, and foreign bridge programs. Examples of these include the Great Road State Bridge in North Smithfield, RI, the Goldstar Bridge spanning the Thames River in New Haven, CT, and the Corinth Canal Bridge in Corinth, Greece. 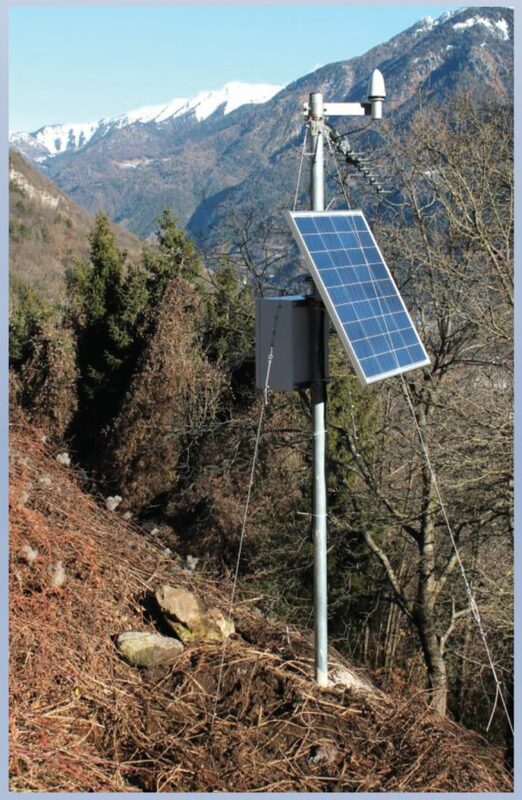 (Figure 7) Each site integrates miniature solar energy harvesters to power a network consisting of MicroStrain’s wireless sensor data aggregator and wireless nodes. In Corinth, a seismically active region, the bridge design featured partial seismic isolation, and the bridge operator wanted to assess the effectiveness of the isolation design during actual seismic events. The system samples accelerations continuously at 200 Hz. A circular memory buffer with event triggers automatically retrieves and saves pre- and post-event data when user-defined thresholds are met. 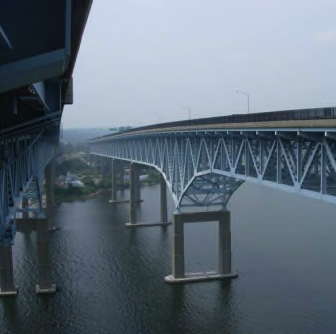 maintaining and collaborating on bridge performance data can present a substantial burden. SensorCloud™ has enabled bridge researcher engineers to cost effectively maintain, share and model bridge performance on virtually any scale. The coupling of advanced wireless sensor networks with innovative cloud-based data analytics revolutionizes performance monitoring of remote structures. Used over the long-term, operators can gain valuable insight into the deterioration of structures and its corresponding effect on performance. By making bridge monitoring systems less disruptive to install and easier to manage, these benefits can be achieved more efficiently, and on a greater scale. As a result, both existing and next generation infrastructure can access the values of condition based maintenance, repair and modeling.